At a glance Unlimited 1.5% cash back Earn unlimited 1.5% Cash Back rewards on every purchase made for your business. Rewards Program Agreement: For more information about the Ink Business Unlimited rewards program, view the latest Rewards Program Agreement. We will mail your Rewards Program Agreement once your account is established. If you become a Chase Online customer, your Rewards Program Agreement will also be available after logging in to chase.com/ultimaterewards. Cash Back and Points: "Cash Back rewards" are the rewards you earn under the program. Cash Back rewards are tracked as points and each $1 in Cash Back rewards earned is equal to 100 points. You may simply see "Cash Back" in marketing materials when referring to the rewards you earn. How you can earn points: You'll earn points when you, or an authorized user, use an Ink Business Unlimited card to make purchases of products and services, minus returns or refunds. Buying products and services with your card, in most cases, will count as a purchase; however, the following types of transactions won't count and won't earn points: balance transfers, cash advances and other cash-like transactions, lottery tickets, casino gaming chips, race track wagers or similar betting transactions, any checks that access your account, interest, unauthorized or fraudulent charges, and fees of any kind, including an annual fee, if applicable. 1.5% Cash Back: You'll earn 1.5% Cash Back rewards for each $1 spent. How you can use your points: You can use your points to redeem for any available reward options, including cash, gift cards, travel, and products or services made available through the program or directly from third party merchants. Redemption values for reward options may vary. Points expiration/losing points: Your points don't expire as long as your account remains open, however, you will immediately lose all your points if your account status changes, or your account is closed for program misuse, fraudulent activities, failure to pay, bankruptcy, or other reasons described in the terms of the Rewards Program Agreement. Accounts subject to credit approval. Restrictions and limitations apply. 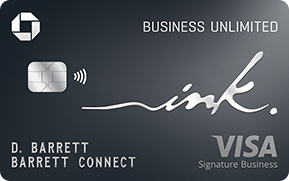 Ink Business Unlimited credit cards are issued by Chase Bank USA, N.A. Offer subject to change.